Some people think you sell with instinct, personality or aggressiveness. Not so. The experts agree that the real foundation for sales success is mastering critical sales skills so they can be utilized to identify customer needs and sell to them while building long-term relationships. If you are interested in improving your sales skills, this certification is ideal. Professional selling is very complex and challenging due to the variety of customers, their different needs and expectations, the variety of products, budget availability, omnipresent competition, and much more. That’s why effective salespeople must be armed with appropriate skills and tools. This certification provides an outstanding foundation in selling skills, regardless of what you are selling or hope to sell. It not only includes core selling skills (the bottom-line essentials), but it also moves into the advanced skills that enable the performance of top producers. By achieving certification you will benefit from a variety of processes and models, along with an extensive inventory of sales tools. All of these modules have been validated by Porter Henry & Co. with tens of thousands of salespeople selling successfully to businesses and individual buyers. 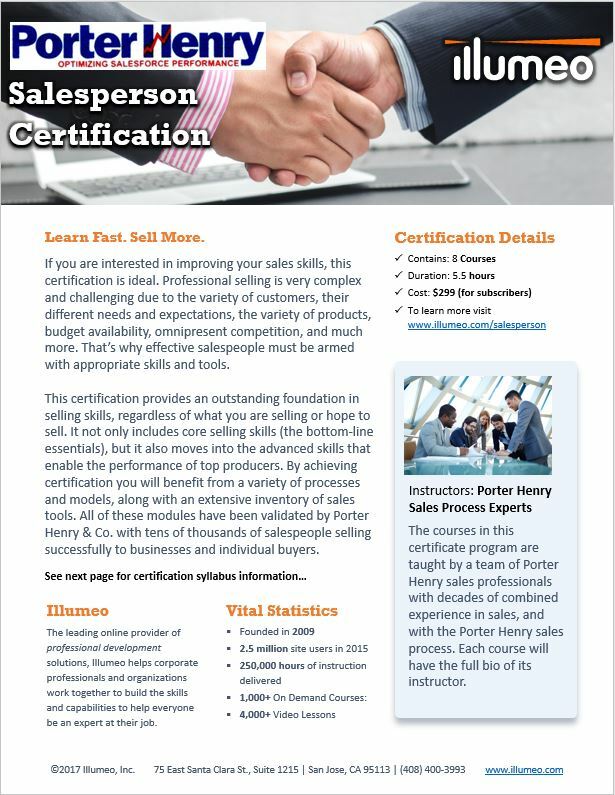 The courses in this certificate program are taught by a team of Porter Henry sales professionals with decades of combined experience in sales, and with the Porter Henry sales process. Each course will have the full bio of its instructor. This class teaches you how to plan a realistic consultative selling call from beginning to end, including a post-call evaluation. This course covers a variety of techniques for handling objections or resistance and a menu of closing techniques to help you gain commitment. This course covers how to successfully gain appointments with executives by capitalizing on phone, email, social media, and networking. This course helps you sort your accounts into categories for sales call frequency and optimize your chances for success. This course provides both strategy and tools for those challenged to access and sell decision-makers and C-Suite executives. This course covers how to quantify customer benefits, savings, and solutions -- and sell more! This course explains how to capitalize on a collaborative style, armed with offense/defense tactics, to gain a win-win solution. This course uncover the key steps of negotiating planning: when and how to make your offers, how to set parameters and more.